What’s in a wobble? Well, according to the most diehard of luxury watch collectors, it is whether or not the 24-hour hand on a vintage Rolex GMT model twitches slightly when the time is adjusted. This is a very big deal. 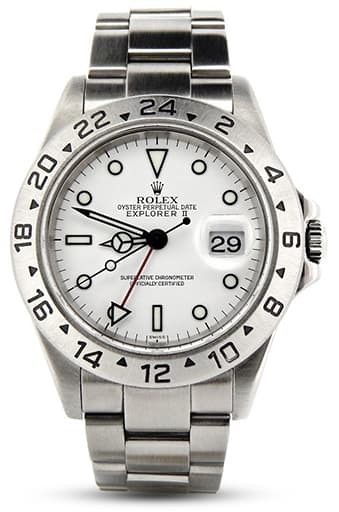 It is the quickest way to identify whether an Explorer II ref. 16570 or GMT-Master II ref. 16710 are being powered by the Rolex Caliber 3185 or the non-wiggling Caliber 3186, which was introduced later in the production run. While that may not seem like a matter of life and death to the uninitiated, it’s a quirk that can add a considerable premium on to the price of the more recent caliber models. It would certainly seem to be a trait that matters more to Rolex collectors than to Rolex itself. The Caliber 3185, hand-slop and all, was made from 1988 to 2005, a long and successful run and one that was only upgraded due to the brand perfecting its Parachrom Bleu hairspring technology. Replacing the 3185’s Nivarox hairspring, the 3186’s Parachrom is made from an alloy of niobium and zirconium, with an oxide coating that turns blue as it reacts with the air. As well as being completely resistant to the effects of magnetism, the number one enemy of mechanical watch movements, the new spring also gives ten times more shock protection. With the movement’s heartbeat updated, Rolex also moved the wheels of the 3186’s drive train closer together, eliminating the shimmy of the older caliber and delighting their fastidious fans. In most every other respect, the two movements are very similar. They both take the architecture of the Cal. 3135 as their base, with the addition of a GMT complication. The Caliber 3185 was the replacement for the short-lived Cal. 3085, the first in-house Rolex mechanism to feature an independently adjustable 24-hour hand, and the caliber that sat inside the inaugural reference of the GMT-Master II from 1983. The ‘Fat Lady’ enjoyed just five years in production before being superseded by the second generation of the brand’s aviator watch, with the 3185 providing identical functionality, but with a slimmer profile that allowed for a return to a more gracefully proportioned case. As a caliber, the 3185 followed brand tradition of function over form. With very few exceptions, nothing in the Rolex catalog features a see-through case back to give wearers an experience of their watch’s engines in motion. It means that, while the finish on their calibers may not live up to the likes of a Philippe Dufour or a Piaget Micro Rotor, the company is free to engineer movements that concentrate on the most important aspects—accuracy, reliability and robustness. Rolex calibers are designed to shrug off the harshest treatment that can be thrown at them, and keep perfect time while doing so. They achieve it through a number of factors, one of which being their physical size. The Cal. 3185, along with most of the rest of the 3100 series, is 28.5mm in diameter, with a height of 6.45mm. Contained inside those generous dimensions are eight different bridges, the parts that provide a mounting point for the separate components and create the framework of the movement. Fitting together to form one solid whole, the bridges give the mechanism an inherent strength that can withstand a lot of punishment. In addition, Rolex has dedicated itself to pioneering new metal technologies, and the Cal. 3185 uses a balance wheel made from Glucydur, a copper and beryllium alloy that is paramagnetic and resists expansion in differing temperatures. The 31-jewel movement also maintains the brand’s signature frequency of 28,800bph—a high beat speed that gives an increase in accuracy and resilience as well as the trademark eight beats per second sweep on the seconds hand. A true workhorse in Rolex’s enviable range, the self-winding GMT movement with the 50-power reserve has provided valuable service inside some of the brand’s most important references. The ref. 16710 appeared in 1989, replacing the Fat Lady and offering a choice of bezel colors for the first time on a GMT-Master II. Along with the red and black of the inaugural Coke surround, the new watch also brought the welcome return of the red and blue Pepsi found on the 1956 original, as well as a solid black bezel, with an elegantly stealth-like quality. Representing the last of the old guard, the 16710 is now a highly sought-after classic reference as it has become the final version before the introduction of Rolex’s new Cerachrom bezel inserts. While the new ceramic is virtually unbreakable and completely scratchproof, it is also so sophisticated that its color doesn’t fade with age, denying modern watches the subtle patina that so delights fans of vintage models. In production until 2007, the 16710 underwent a number of variations throughout its life, and not just in the caliber switch to the 3186. Until 1997, Tritium was used for the lume on the watch’s hands and hour markers; still a radioactive substance, but at a much lower level than the Radium it had replaced in 1963. Although much safer, Tritium had a relatively short useful life, leaving older watches with only a tiny amount of luminescence after a few years. Rolex made the shift to Luminova in 1998, a photoluminescent paint made by Japanese company Nemoto and Co. that was completely radiation-free and, just a year later, updated it again with the slightly enhanced Superluminova. The GMT-Master II is a much-loved emblem of Rolex, an instantly recognizable archetype and a tough as nails performer. The ref. 16710 is perhaps the ultimate example for collectors. The end of the aluminum bezels, it is also the last time a Pepsi color scheme was available on a steel case. If you want that classic red and blue livery on the modern version, you’ll have to dig deep for the white gold model. While the rotatable bezel on the GMT-Master II allowed it to track not just two, but three, time zones, the Explorer II has always had an engraved, fixed surround since it debuted in 1971. More a genuine tool watch than one aimed at luxury business travellers, the Explorer II was designed for and targeted at the kind of people whose lives took them to the most extreme environments—more specifically, speleologists and Arctic adventurers. Cave explorers (in case you were wondering what a speleologist was) who spend days, if not weeks, underground, are practically guaranteed to lose track of night and day down there in the dark. On Arctic expeditions, where the sun never sets in the summer or rises in the winter, there is a similar problem. The extremely tough Explorer II, with its bright orange GMT hand, is the no nonsense watch purpose-built for these admittedly niche groups. Building on the lessons learned from the original Explorer, which emerged from the prototype Oyster that saw the top of the world from Edmund Hillary’s wrist, it has long remained in the shadows of the rest of the Rolex sport range, due to its limited market. More recently however, as the likes of the Submariner and Daytona become ever more gentrified, with their gold and platinum shells and ceramic bezels, the demand by collectors for a return to Rolex’s roots has been satisfied by the simplicity of the Explorer II. It is a watch that represents the essence of the brand. Crafted only in steel, and with just two dial options, black or white, it is a pure performance model, rather than a status symbol. The ref. 16570 first appeared in 1989, and ran right up until 2011. Powered by the Cal. 3185 for most of its life, the 3186 took over in 2006, curing the hand wiggle that sets the two apart. A long running model certainly, but one missing an important feature beloved by vintage enthusiasts. That distinctively orange 24-hour hand, known colloquially as the Freccione, after the Italian for arrow, turned a far more subdued red and shrank to a fraction of the size. Almost an apology of its former self, it proved a turn-off for buyers and left an extremely capable watch a poor seller, even by its own modest standards. But, as is the way with Rolex collectors, who are an authority unto themselves, what was once an unpopular model often gets a new lease of life years or decades down the road (just ask any original Daytona owner). The ref. 16570 is now seen as an important transition, albeit a long one, reference. Demand for the last of the 40mm Explorer II’s is increasing steadily, a model every bit as indicative of the brand as the GMT-Master series, but with a more attainable price tag. With the Rolex Caliber 3185, Rolex continued their ethos of building rock-solid movements to sit inside their range of iconic watches. Always beautifully functional, and with nothing more than the essentials, it was made to do a job and to do it for several lifetimes.